VLADIVOSTOK, Russia, Sept. 11 (Xinhua) -- Chinese President Xi Jinping and his Russian counterpart, Vladimir Putin, on Tuesday called for promoting sub-national cooperation to cement bilateral relations and benefit the two peoples. The two heads of state made the remarks while attending a roundtable meeting on regional cooperation between the two countries on the sidelines of the fourth Eastern Economic Forum (EEF), which is running from Tuesday to Thursday in Vladivostok in Russia's Far East. Noting that China and Russia are each other's biggest neighboring country and most important comprehensive strategic partner of coordination with extensive common interests, Xi said it is conducive to jointly addressing external risks and challenges and boosting common development and revitalization for the two sides to strengthen cooperation and deepen the integration of their interests. Sub-national cooperation plays an important part in bilateral relations, and cooperation plans between the two countries should rely on their local regions, be implemented in local regions and benefit local regions, Xi said, stressing that the closer the sub-national cooperation is, the more solid the foundation of the China-Russia mutually beneficial cooperation will become. For future cooperation at sub-national levels, the Chinese president proposed that local governments should strengthen overall planning and coordination, optimize policies, forge more partnerships, and create a better business environment and more convenient conditions for the companies of the two countries to invest in each other's regions. He called for innovating the ideas for cooperation, expanding the areas for cooperation, better using the platforms and mechanisms for cooperation, and exploring new ways to advance regional cooperation. Xi also asked local governments to give full play to their complementary advantages and their distinctive sectors, push for more precise ways of cooperation, and create highlights in cooperation. In addition, he called for increasing people-to-people and cultural exchanges, cementing the mainstream public opinion and social foundation for cooperation, and promoting institutionalized and regular exchanges in culture, tourism, education and media at sub-national levels. Xi said that it is the right time for the two countries to strengthen regional cooperation as he and Putin had agreed to designate 2018 and 2019 as the years of China-Russia local cooperation and exchange. The governments of the two countries will support their local regions in making the pie of cooperation bigger and sharing the fruits of cooperation, Xi said, while expressing the hope that the representatives of Chinese and Russian regional governments at the roundtable can grasp the opportunity to usher in a new era in China-Russia sub-national cooperation and contribute more to bilateral relations. Pointing out that sub-national cooperation is an important part of the Russia-China comprehensive strategic partnership of coordination, Putin said he is delighted that the local regions of the two countries have carried out close economic and trade cooperation as well as people-to-people and cultural exchanges. The Russian government welcomes Chinese businesses to invest in the country and is willing to continue to offer favorable conditions to strengthen sub-national cooperation between the two countries, he said. Under new circumstances, Russia and China should improve connectivity, promote trade and investment liberalization and facilitation, deepen friendship between the two peoples, and push for more results from sub-national cooperation that can benefit the two peoples, Putin said. 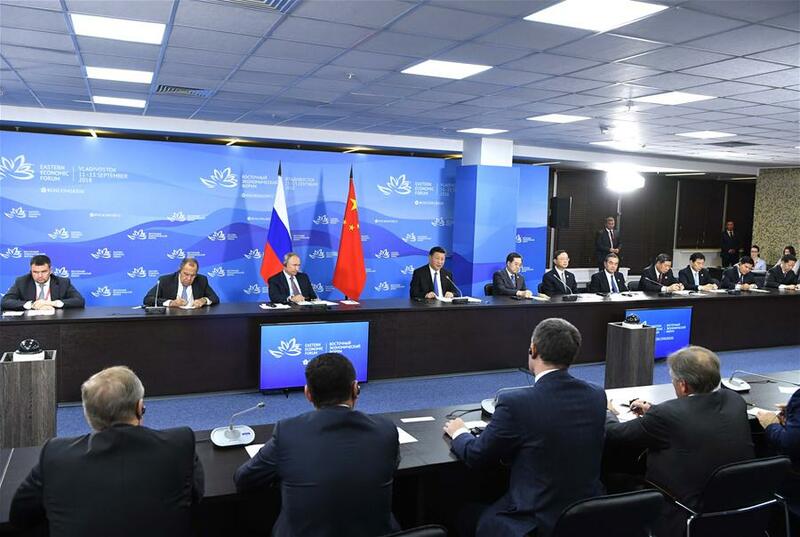 The heads of nine Chinese provincial-level regions and 13 Russian federal subjects took part in the roundtable meeting. Xi arrived in the port city of Vladivostok on Tuesday to attend the EEF. He will address the plenary session, the main event of the forum, on Wednesday. The EEF was launched in 2015 on the personal initiative of Putin. Xi's attendance will be the first by a Chinese head of state at the forum. After attending the roundtable meeting, the two heads of state visited "The Far East Street" exhibition showcasing the rich local cultural exchanges between the two countries and investment opportunities in Russia's Far East regions.